The Olivier Awards with Mastercard is usually a whole host of emotions. From the disbelief and happiness from winners, and nerves of every nominee, to the sheer delight on our red carpet presenter’s faces when they see how stunning everyone looks, all the feels are happening that night. And the emotions aren’t just kept to the Royal Albert Hall, the audience at home also showed their thoughts, feelings and reactions to the evenings’ celebrations. Here are some of our favourites. One thing that became evident during the Oliviers was how darn proud the shows were of their nominated cast members. Come From Away in particular went to a huge effort to support their nominees. From shout-outs from Come From Aways in other countries to publishing the sort of tweet your parents would definitely send when they’re proud of you, Come From Away were showing the pride and love throughout the night. We love our host, presenters, and of course, our lovely voiceover for the evening, Zoe Wanamaker. And it seems like you loved them too! Catching up on last night's #OlivierAwards and all I want is for @ZoeWanamaker to be my internal monologue. There were some absolutely cracking speeches at the Olivier Awards. From Patsy Ferran starting off her speech with simply an introduction to herself, to Jonathan Bailey’s heartfelt message to the LGBTQ community, there wasn’t a dry eye in the place. And it seems like a lot of the audience loved the speeches too! "I wasn't crying for seven hours, I was crying for six hours and thirty minutes so 😛" – probably one of the greatest underrated quotes from last night's #OlivierAwards, bless you Kyle Soller. 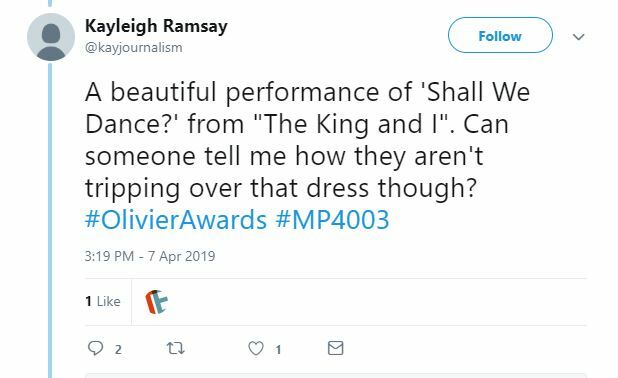 Delighted to be namechecked by Jason Manford at the #OlivierAwards tonight. A basket of Chorley cakes is in the post… Meanwhile, all our shows are winners! There were incredible performances from the nominated musicals this year (Caroline, Or Change; Come From Away; Company; Fun Home; The King And I; Six; and Tina – The Tina Turner Musical) as well as an unforgettable opening number from Disney’s The Lion King, to celebrate their 20th year in the West End. And it seems like you agree that these shows knocked it out of the park with their performances! The Olivier Awards are the perfect excuse to take a look back at the last 12 months of theatre and reflect on how awesome it was. And it seems people on social media were keen to express how much they love both the theatre and the sense of community it brings them.